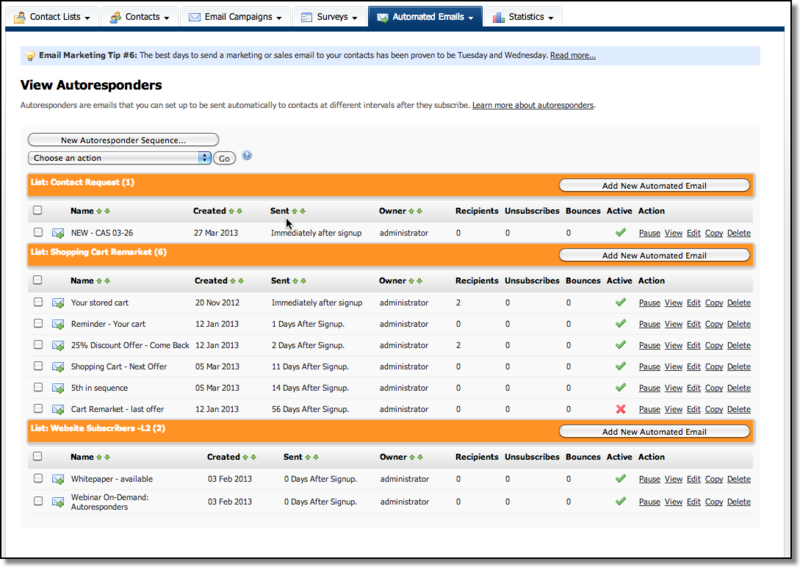 We’ve taken permission-based email marketing to a new level by giving you more features than any other system. Start today. Create Awesome Emails. Preview in 30+ Clients. Automate. Share. Track. Get 99% Inbox Delivery. – Upgrade within 15 days. Thousands of businesses trust the Pinpointe platform for robust, reliable, no compromise email marketing and up to 99% delivery. Shouldn’t you? 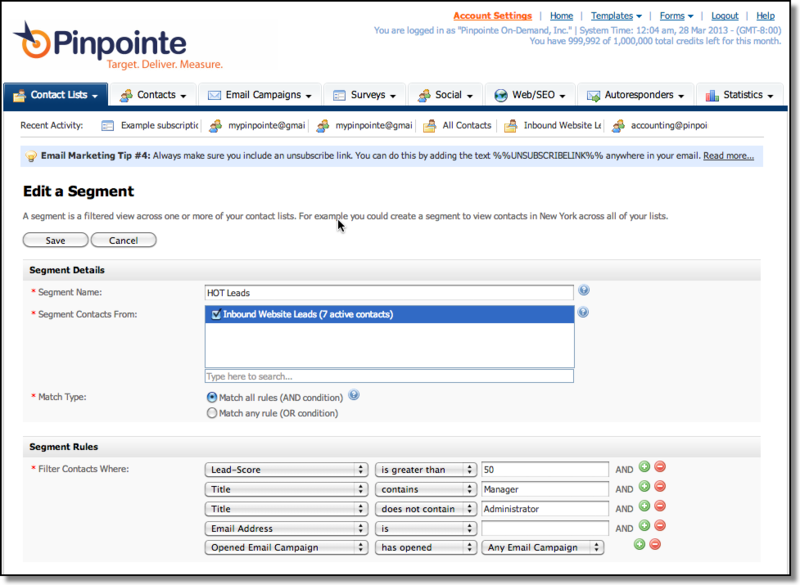 With Pinpointe, you can magnify your email campaign results by automatically adding social follow, share and like buttons to your email marketing campaigns. Adding social sharing to email campaigns is simple – you’ll enter your social accounts in the configuration tab, then create an email campaign. Select ‘Insert Social’ from the pull-down menu. We include several different social-share icon styles. 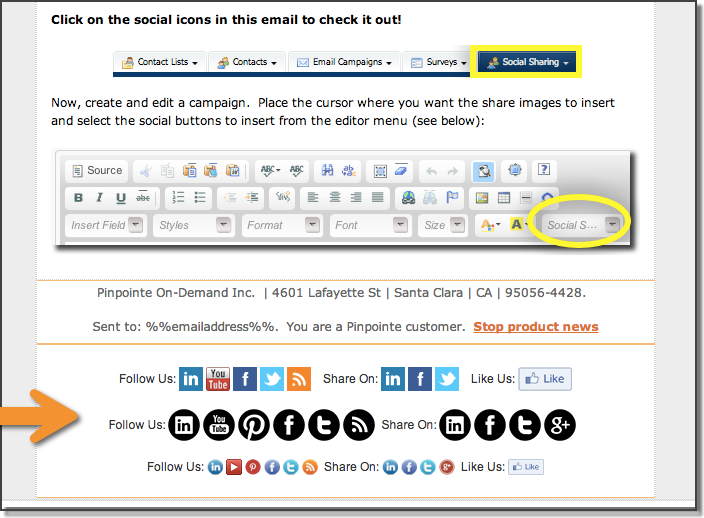 Pinpointe automatically inserts the social sharing code for recipients to ‘follow’, ‘share’ AND ‘like’ your email campaign when it’s sent. We believe in permission-based email marketing (no purchased or non opt-in lists.) We’ve nurtured relationships with all major ISPs and participate in feedback loops. Our IPs are ReturnPath certified. We monitor IP reputation with multiple leading third?party deliverability vendors to ensure that inbox acceptance rates for our quality customers achieve 96% ~ 99% inbox delivery rates. Maximize your time efficiency. Autoresponders have been shown to increase results by over 100%. You can set up drip marketing campaigns using Pinpointe’s super-flexible autoresponder campaigns, and send trigger campaigns based on your prospect’s behavior. 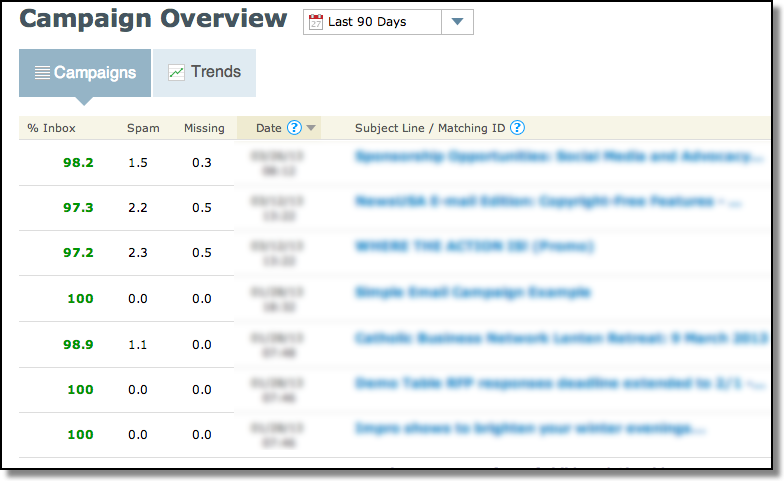 Set up an automatic drip sequence with specific filters for each individual email. You can even set up autoresponders to send on behalf of different people within your company. Our ‘smart-segments’ allow you to target your prospects with precision. Define your complete segment criteria by combining behavioral information (like, whether subscribers opened a campaign or clicked on specific links), demographics information and custom field values you create. With our new lead-scoring (*) you can even create a smart segment for ‘hot leads’, based on user’s website and email behavior. 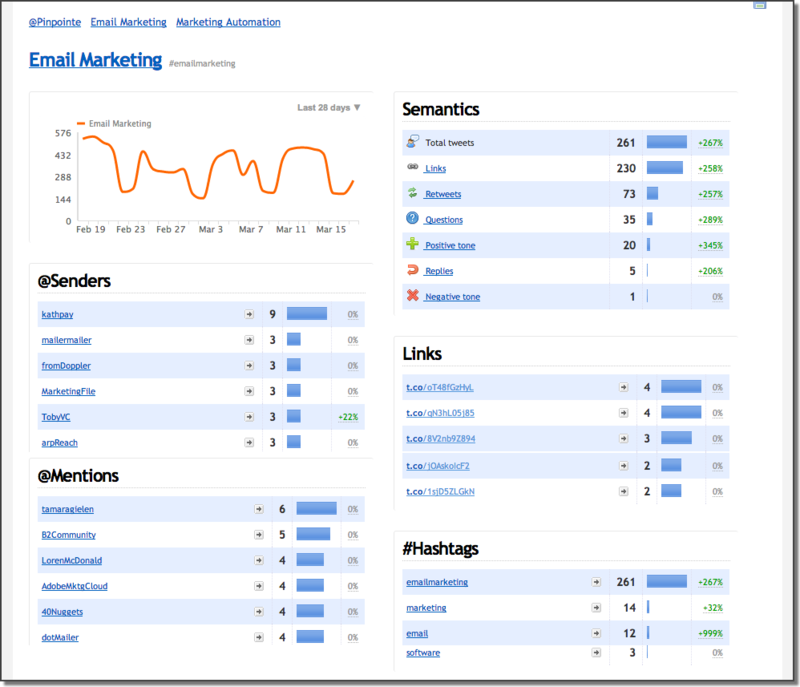 If you’re using Pinpointe’s real time web analytics add-on, you can ‘mine’ twitter streams in real time for important information relevant to your business — like mentions of your company name, or important hash tags, and see real time results. 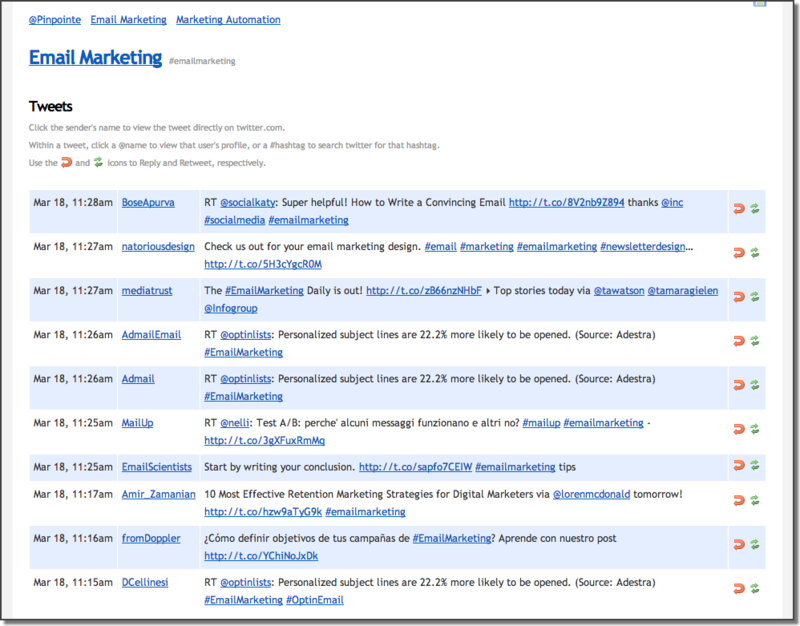 Get up to the minute information on the Twitter users who are talking about your company, your industry and your competitors, or any other information that’s relevant to your business. 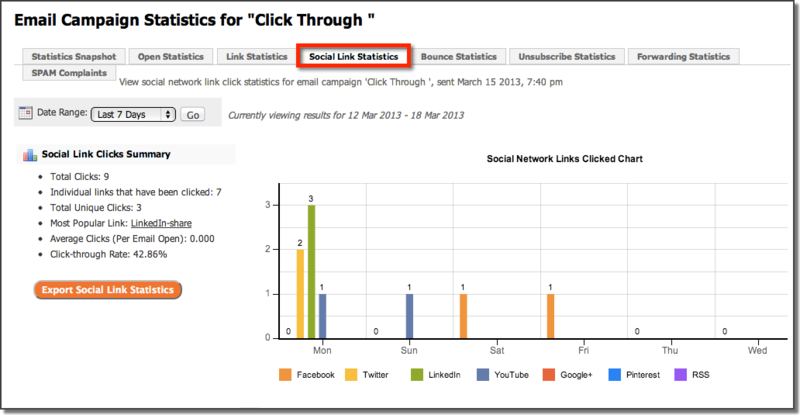 When you send email campaigns through Pinpointe, your social links are automatically tracked so you can see exactly which recipients clicked your social links and shared your great campaign content! Social sharing is great because you get an extra campaign response ‘boost’ every time someone shares a campaign. If you’re using our real-time web analytics with Pinpointe’s award-winning email marketing service, you can even re-tweet and reply right here within Pinpointe! With our real-time tweet mining of relevant information – Pinpointe’s social marketing system becomes a great lead prospecting tool to help you easily find interested prospects and interact with them. * Pinpointe is only for sending permission-based emails. No purchased lists, association directories, traded lists or shopping lists… Yes, we do check. No, there’s no such thing as a purchased opt-in list. Trust us. Please read our anti-spam policies to avoid a regrettable account cancelation – or call us at (800) 557-6584 to discuss if you have questions.